Lexington City administrative offices are located at 200 East Main Street, Lexington, KY 40507; phone: 859-425-2255. 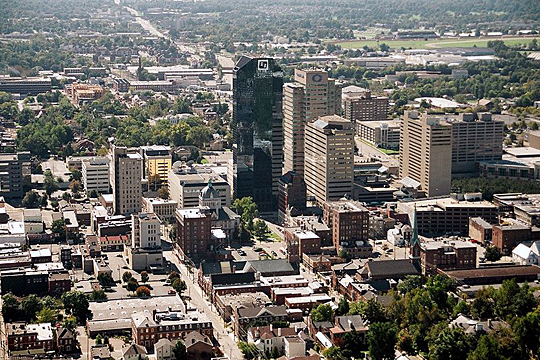 Photo: Helicopter view of Lexington, Kentucky, original photo by user:Madgeek1450, 2006, en.wikipedia.org, accessed April, 2011. In 1974 Fayette County and the City of Lexington merged their governments forming a consolidated city-county, the Lexington-Fayette Urban County government. Lexington lies on a rolling plateau in the heart of Bluegrass Country. An early law passed in Fayette County (just after the Revolution) was designed to keep the blood of race horses pure. The law was superfluous. The city had few industries except those that had to do with tobacco and horses. The city was named after the Battle of Lexington by Robert Patterson, Simon Kenton, and others who in June 1775 were camped nearly opposite the Lexington Cemetery while on their way to build a fort near the Kentucky River. The town was founded 4 years later when a blockhouse was put up at Main and Mill Street. A charter was granted by the General Assembly of Virginia in 1782. In 1784 General James A. Wilkinson, a friend of Washington, entered his checkered western career by opening a store in the village. The next year the first tavern hung out its sign on West Main Street which read "Entertainment for man and beast by James Bray." In 1727 Transylvania Seminary was moved here from Danville. The first issue of John Bradford's Kentucky Gazette appeared in the same year. Merchants brought wares from Philadelphia and Baltimore, accepting payment in ginseng, homespun linens, and cured meats. Hemp, a fine cash crop, and lumber, tobacco, and whiskey were exported. Money was scarce, barter common. Change was made by cutting coins into halves, quarters and eighths. Raw materials were made into shoes, hats, woolen goods, ducking, white lead and other commodities. Most important of all was the making of hemp rope for ships' rigging. Lexington was the chief industrial city of Kentucky until about 1820 when the paddlewheeler began industrializing the Ohio River Valley and attracting inland industrial plants to the river bank. One early industry that the Ohio River had nothing to do with was the breeding of light horses — thoroughbreds, trotters and saddle horses. "They may race 'the ponies' at Louisville, Santa Anita, Paris, France or Timbuctoo," says the staunch booster of Lexington, "but they breed them and rear them and train them at Lexington." It was a horse named Lexington, goaled in 1850 at The Meadows, an estate nearby, that founded the family of Fair Play, Man o' War, and War Admiral, and many say there were others here just as good. The men from Virginia and Maryland who settled the city rode their best horses over the mountains, or floated them on flatboats down the Kentucky River. The first impromptu Lexington races were held in 1787, the first jockey club organized 10 years later. In the early years of the next century breeding stallions were imported from England and Arabia. From these were bred the modern race horse of the early 20th century and beyond. By 1800 schools of medicine and law had been added to Transylvania Seminary, making the town one of the most important academic centers in the West. Notables came to town and college: Henry Clay led a group of men who for 50 years spread the fame of the college and Lexington across the nation. In 1830 Lexington started to build the Lexington and Ohio Railroad, which was finished in 1832 to a point 6 miles west of the town. That year the town became a city. Despite a cholera epidemic that swept the Bluegrass in 1833, killing 500 in the city alone, the young metropolis at the end of the decade was riding high on increased farming and light horse and livestock breeding. The richest money crop of those days was hemp, which went into the rigging of Yankee clippers. The soil was also fine for tobacco, which became much more important to the city. The nationwide panic of 1837 stifled Lexington business. Then, as the city was getting back on its feet, North and South came to blows. Although the town gave a cavalry general, John Hunt Morgan, to the South, and Jefferson Davis went to school here, Lexington also spilled its blood for the Union. The War between the States, however, established the cigarette market. Before the war, men were content to chew tobacco or smoke an occasional cigar; but soldiers began "rolling their own" with bits of tobacco, and unconsciously started one of America's biggest industries. When the war was over they carried a craving for cigarettes to all corners of the expanding Nation. It was a good thing for Lexington, because steam was driving the clipper ship from the seas and Lexington's hemp lay unsold. Lexington after the war, however, concentrated primarily on horses. In the 1870s, when the bookmakers appeared and betting became an industry, racing again revived — and with it Lexington's favorite work of breeding, rearing, and training thoroughbreds. The great horse farms began to revive; wealthy easterners, attracted to the Bluegrass, started to buy land, build estates, and raise horses. Neighborly dash races were held, and stallion shows were feature events just outside of town. During the war, the State-supported University of Kentucky was started in the city. It took over much of Transylvania Seminary's work, whose faculty and students were scattered by the war. Transylvania later affiliated with the College of Bible and specialized in religious teachings. Growing swiftly after 1900, the university was modernized and expanded. World War I boomed the cigarette industry. Tobacco sales and prices went so high that Lexington did not suffer much when prohibition came and closed the distilleries. With record crops and soaring prices, tobacco money became plentiful in the Bluegrass and its capital. When Lexington celebrated its sesquicentennial with a round of speech making and pageantry in 1925, it was a wealthy and going city. The 1929 crash hit the city hard for awhile. Poverty-stricken farmers in other States and in Kentucky all began to grow tobacco. Prices held up until excess production cut them sharply in 1932. They lay at rock bottom until the great drought in the middle 1930s, and then began to rise gradually. The University of Kentucky, by the 1930s, was one of the most important sources of business in the town. Each year thousands of school children, farmers, ministers, and others flocked to Lexington to attend conferences and athletic contests conducted under the auspices of the university. Hundreds of research people came annually to the town to use the rare materials contained in the two university libraries and the Lexington public library. The combined collections were a notable collection of Americana as related to the Ohio Valley.